“The 12-mile-wide reservoir could solve a Martian mystery—and offer a new target in the hunt for extraterrestrial life. Liquid water is refreshingly abundant on moons in the outer solar system, but it has proven surprisingly tough to find in reliable quantities on Mars—until now. Radar scans of the red planet suggest that a stable reservoir of salty, liquid water measuring some 12 miles across lies nearly a mile beneath the planet’s south pole. What’s more, the underground lake is not likely to be alone. “There are other areas that seem to be similar. There’s no reason to say this is the only one,” says Elena Pettinelli of Italy’s Roma Tre University, a coauthor of the paper reporting the discovery today in the journal Science. If confirmed, the buried pocket of water could answer a few questions about where Mars’s ancient oceans went, as well as provide a resource for future human settlements. Even more thrilling for astrobiologists, such a feature may be an ideal habitat for extraterrestrial life-forms. Billions of years ago, Mars was likely warm and covered in seas like its larger, bluer neighbor. But the Mars of today is a parched, toxic desert, and for decades, scientists have been trying to decipher what happened to the water that once soaked, sloshed, and tumbled over its sands. 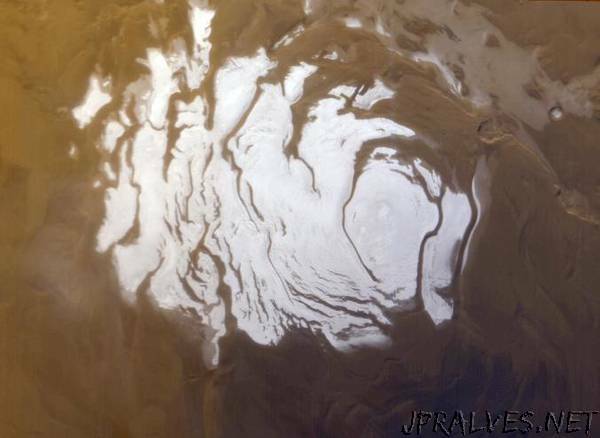 To date, scientists have found water on Mars multiple times, but it’s usually quite transient or inaccessible, either hovering in the atmosphere, locked into permafrost or polar caps, or perhaps seasonally seeping down crater slopes. And the amount we’ve found doesn’t quite fill those ancient Martian seas or make crop-growing particularly easy. “We know there was a lot of water on Mars’s surface, and we can’t quite account for all of it today,” says Bobby Braun of the University of Colorado, Boulder. So, scientists hypothesized that some of the missing water could be trapped in subsurface aquifers containing vast stores of liquid. However, humans didn’t launch spacecraft capable of sniffing out buried water until earlier this millennium. One of them, the European Space Agency’s Mars Express spacecraft, has been orbiting the fourth rock from the sun since 2003; riding on board is an instrument called MARSIS, which uses radar pulses to see into the Martian subsurface. It works by sending low-frequency radio waves into the planet, which burrow beneath the ground until they bounce off geologic structures and boundaries. By studying how those waves are reflected back to the spacecraft, scientists can infer what might lie beneath. In 2008, the MARSIS team saw glimmers of what could be some very bright reflections near the planet’s south pole, in an area where frozen ice sheets are stacked atop one another. On Earth, the brightest radar reflectors are pools of briny water—and so the team decided to take a closer look at the region. After a few years of gathering data that weren’t exactly useful, the team finally began collecting enough observations in 2012 to assemble a bigger picture. From there, it took another three years and 29 spacecraft passes before scientists had enough information to work with. Sorting through the MARSIS data wasn’t easy. Over the next two years, the team compiled and processed the observations and worked very hard to rule out alternate possibilities, such as deeper layers of carbon dioxide ice. Eventually, by comparing the reflectance patterns on Mars with those seen on Earth, scientists were convinced that they’d found a subglacial lake. Perhaps several feet deep, the lake contains various salts that help keep it liquid at extremely cold temperatures, the team speculates. The Mars Express team compares the discovery to lakes tucked beneath the ice sheets of Greenland and Antarctica, which are sometimes huge and certainly more than capable of hosting life as we know it. But not everyone is convinced that the “lake” is actually a lake. Even according to the team, it could instead be a deposit of dampened sludge, more like muddy sediments than a pocket filled with liquid. Determining the exact nature of the structure will require a different instrument, Pettinelli says. There is another ground-penetrating radar orbiting Mars right now, and it adds an interesting twist. “We do not see this reflector,” says Bruce Campbell of Smithsonian’s National Air and Space Museum, who is a member of the team operating an instrument called SHARAD on NASA’s Mars Reconnaissance Orbiter. MRO has orbited Mars since 2006, sweeping its radar over vast swaths of alien landscape, including many passes over the south pole’s layered deposits, and it hasn’t turned up anything resembling a reservoir. This is likely because MRO’s radar uses different wavelengths that are scattered by the polar ice before they reach the potential reservoir’s depth, says Jack Holt of the University of Arizona. But anything as reflective as a liquid lake should be identifiable by SHARAD, he notes. In all, scientists are eager to confirm the finding—including those on the MARSIS team. Assuming it’s there, this little pocket of saltwater may help solve the mystery of Mars’s missing oceans. It’s also a clue about the planet’s hydrological cycle, which is theorized to involve buried aquifers charged by melting polar ice caps, with the bulk of the water running north from the southern highlands, says Nathalie Cabrol of the SETI Institute. No stranger to water in weird places, Cabrol’s work on Earth includes investigating Mars analog environments, which sometimes requires diving into lakes tucked among the peaks of the high Andes. Whether the MARSIS find is soggy sediments or an actual lake, she says it’s thrilling. On the other hand, she notes, “it would be a very problematic place to go, because it would be under the special regions for planetary protection,” she says, referring to the UN regulations aimed at preventing interplanetary contamination of habitable environments. The new reservoir is also the kind of resource that humans interested in settling on Mars might want to take advantage of—though perhaps not right away. “I think it’s very unlikely the first humans on Mars are going to drill down to several kilometers,” says Braun, an advisor for National Geographic’s MARS series and NASA’s former chief technologist.